This raspberry smoothie recipe is adaptable and flexible so you can use whatever you have to hand. I’m always surprised by how many of my clinic patients say they don’t like smoothies, this recipe is so delicious it could convert even the most sceptical amongst us. #1 Smoothie making tip: make your smoothies delicious! 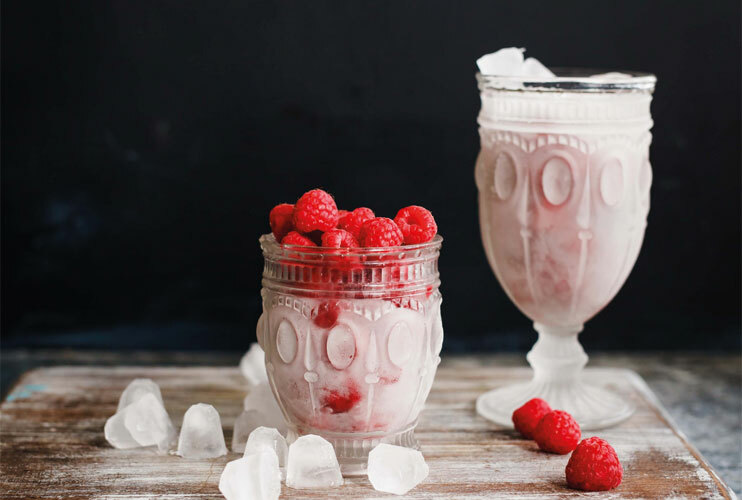 Raspberry is my number one favourite smoothie ingredient so I make sure I have a supply of frozen organic raspberries from my health food shop. I like my smoothies really delicious and tangy as well as nutritionally dense, it makes sense, the more delicious it is the more likely you are to reach for it every day. If you like another kind of fruit – simply substitute your preferred ingredients. The red berries are particularly good as they contain smaller amounts of sugar than other fruit and just happen to be particularly tasty. This is a smoothie for when you’re seeking something indulgent without the guilt. The coconut makes this an excellent morning shake for on the go to work or before or after training. It’s loaded with the sharpness of raspberries and the sweetness of fresh fig. Quite apart from being delicious, raspberries are a good source of Vitamic C. Figs contain minerals such as calcium, iron, magnesium and potassium and good amounts of fibre. The fruit sugar is balanced by the addition of almonds, coconut and chia seeds which add an array of minerals, electrolytes, protein and essential fatty acids. When all mixed up in the bullet these nutrient dense extras will also provide a rich creamy texture to compliment the fruit. Combining sugar with protein, fibre and medium chain fatty acids from the coconut is a safer way to consume fruit without risking the blood sugar spikes you may have from loading up on pure sugar. A handful of another fruit of your choice. I often use apple just for simplicity as they are always there in the vegbox. For variety you could try fresh chopped figs, banana, frozen pineapple or fresh mango. 1 tbsp of raw coconut flesh – I use dried for convenience – you can also use a good block of coconut cream like the Biona organic range. I also like to add a green superfood powder, this gives you all the nutrition of green botanicals without the bitterness or pulpy fibre that if you use fresh veggies can make a smoothie quite unpalatable. Add to the nutribullet and you’re ready to go!